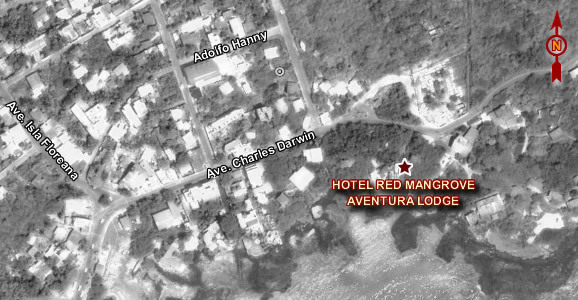 The Red Mangrove Adventure Lodge Hotel is a great choice for vacation in the Galapagos Islands, with family or friends. Located just minutes from downtown Puerto Ayora on Santa Cruz Island, surrounded by a grove of wild red mangrove, which offers guests comfort, privacy and relaxation. Located just minutes from downtown Puerto Ayora on Santa Cruz Island, surrounded by a grove of wild red mangrove, which offers guests comfort, privacy and relaxation. Built in 1995, has a unique architecture and design meets the mangrove forest and the ocean. Its location allows us to observe the mangrove ecosystem in action while enjoying the best view of the bay of Puerto Ayora. The Hotel has 14 rooms, divided into two carriers: the sea and into the mangroves, all equipped with air conditioning, cable TV, private bathrooms and hot water. In addition, the Mangrove Adventure Lodge Hotel features a restaurant beside the sea, where you can enjoy the typical dishes of the Galapagos Islands or the best meal of Japanese food.